Yesterday we had our first Knit In at our Library. It was very well attended and enjoyed by all participants. It is a small step, but it signals more “greening” of our Library and our intent for the future. 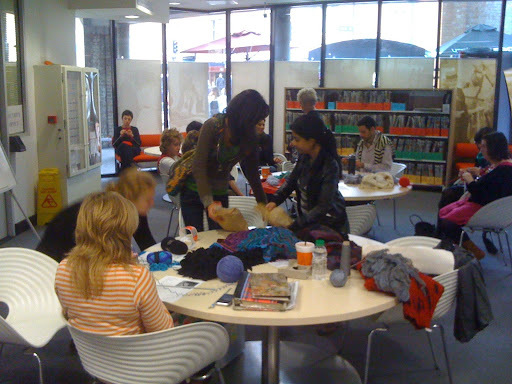 It also brought new people to the Library and we welcomed them well enough that some asked for us to make this a more regular venue for knitters at UTS. quality control & assurance (we do not want to ruin our reputation by having people wandering around in garments that do not fit well or are not stylish). LOL! When I read Part 1 I thought you had been converted from your view of knitters as potential threats, but in Part 2 I enjoyed your return. Hope they make you knit your own fashion item soon. the last point is very important. I think as sponsor of this event, they should knit you some striped socks as a mark of respect.